So tell me, have you ever wrestled with this question when you're about to reveal something personal about yourself? How much do I share? And do they really care ? Well, it looks like this chapter is about finding that healthy balance between transparency and vulnerability without loosing our self-respect, and dignity. Cecil gives us some good insight on this issue. While speaking at a conference, he shares about getting in touch with your inner self and being honest with who you are. He stressed the need to probe inside, to find who you are, and to write from within. He says that writing is an opportunity to move into the deeper parts of ourselves. He writes,"That doesn't mean you have to write everything you understand. The writing process becomes a tool for deeper soul penetration." He goes on to say, "Once you gain insight about yourself, you become stronger and emotionally healthier. Your writing is different, but the principle is the same. If you're open to yourself, you gain insight and realize the implications of how it affects your thinking and your behaviour." As a rookie writer myself, this issue tugs at my own emotions. How do I find the balance between sharing with the readership who I really am, yet maintaining personal privacy for myself and the loved ones in my life. Cecil writes, "Once you integrate the new into your life, that's the time to ask yourself whether you need to write about it. Sometimes that's exactly the path to take. But not always." As I read through the true stories and examples Cecil gives in this chapter, my own thoughts come very clear to me. We all want our voice to be heard. We all want someone to care. We all want to tell the world our stories of survival with the hope of bringing healing to others. When addressing the question: Do I have to write that? The answer Cecil gives is no. But he does encourage us that if we feel compelled to share our pain, recovery, or insight, we won't have peace until we do. He says, "Tell us more than what happened. Tell us what you learned about yourself. And if you didn't learn something that embarrasses or shames you, perhaps you're still not ready to open your heart to the world." I don't know about you but that sounds like humility to me. I've heard it said that if we aren't humbled by our experiences we will not grow from them either. We remain victims instead of victors. 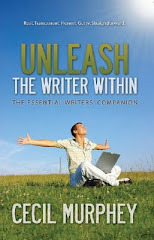 The Aphorism for this chapter is : "When I write from within, I put into words what others think but cannot say."